POLITICS AND FOOTBALL are no strangers. Organising bodies such as FIFA, UEFA and the Olympic committees marinate themselves in political intrigue. There has often been a whiff of corruption about FIFA, dating back decades. The most recent debates about Russia, Qatar and the World Cup rekindled deep-rooted concerns about the legitimacy of bidding and selection processes. Football has always been the sport of the “sweaty, horny-handed sons of the soil” and the pinky-ringed classes have always looked down upon the football fan. Back in the 1970s, a future Bank of England governor, when told I was a Chelsea fan, frowned and suggested I might like to get interested in “rugger”, adding that it would help advance my career. While this well-known high street bank hosted a sherry party for its successful rugby XV in its executive suite, the equally successful “soccer” team was given a jug of beer to swill, doubtless while being consigned to the “public bar” with the send-off: “You’ll like it there, chaps, there’s sawdust on the floor.” Bank employees were more likely to be products of public schools or public school wannabees, and therefore, more familiar with the oval ball than the old pig’s bladder. Chip on the shoulder? You bet. Some legendary figures of the game have positioned themselves as representatives of the man on the terrace. Bill Shankly, for example, was supposedly of the masses, and Brian Clough regularly proclaimed that he was a socialist. I recently spied a banner hanging from the top tier of a stand that declared it an area of “Kop Socialism”. Shankly’s successor, Bob Paisley, was regularly seen donning cardigan and slippers as he shuffled along to the paper shop, moving among his people. There’s more substance to these claims than say, the Chelsea fans’ flags stating that Jose Mourinho was “one of us”. When the “Special One” was sitting in his luxury home, sipping fine wine and counting his euros, I doubt he had anything in common with the zero hours employee from the World’s End estate that spends all he can on an overpriced ticket for the Matthew Harding Stand! If Mourinho was part of the “capital” of Chelsea FC, then capital and labour had never been more detached. You would assume that if the game is of the people, then those countries where socialism is the underlying sentiment would be the sport’s most successful. Not necessarily so. If you interpret football as a form of opium, the modern day equivalent of the Roman empire’s “bread and circuses”, then it is the ultimate distraction. Take modern day Spain as an example. While the country’s economy sat on the precipice of disaster, two of the world’s richest football clubs, Real Madrid and Barcelona, were playing in front of huge crowds every week. Life inside the stadium was warm, exotic and colourful, with the Zara-clad young cheering their teams on. “Outside it is winter, but here it is so hot,” to quote the cavorting emcee from the film, “Cabaret”. Ronaldo runs around earning thousands of euros by the hour, while the average annual wage in Spain is EUR 22,000. It takes Ronaldo 12 minutes to earn the average weekly pay packet in Spain. And “the people” just cannot help themselves in making him richer! When Spain [finally] won the World Cup, the ruling party was the Spanish Socialist Workers Party, described as “centre-left”. Like many parties that were more red than blue, this group abandoned its Marxist theories in the late 1970s. During their last term in office, Spain were World Champions and European Champions. But when Spain relinquished their crown as the former in 2014, the more right-wing People’s Party were in prime position. So like Harold Wilson in 1966, the left could claim their regime had inspired footballing success. Historically, though, right wing governments drove the World Cup agenda. Certainly before World War Two, if you wanted to win the competition, it was a case of installing a hard-line administration and using every trick imaginable to gain an advantage. And if life had gone on after 1938, so to speak, Germany would surely have hosted 1942. That would have been interesting. When Uruguay won the inaugural competition in 1930, the dominant party was the centre-to-right Colorado. When Italy were champions in 1934 and 1938, Mussolini and his gang were in their pomp. There were more black shirts than replica shirts. You can detect the mood of the moment by the artwork that accompanied the World Cup in the 1930s. The poster for 1938 has a boot standing on a ball, at the end of a dark, forbidding limb that looks very aligned to the jackboot of right wing militia. Was there any correlation between right wingers and outside rights? Perhaps so, because the dictatorship regimes were among the first to recognise the value in demonstrating superiority through the virility of its youth – Kraft durch Freude and all that. Militia have played their part in the broader history of the World Cup. When Argentina was awarded the 1978 series, Johan Cruyff, the most gifted European of his generation, decided not to travel to South America due to safety concerns. At the time, the Junta was in full flow, dropping dissidents into the River Plate by helicopter. Moreover, at every big game, there was a huge and intimidating military presence. When the Dutch striker, Robbie Rensenbrink, struck a post in the final minute of normal time against the host nation in the final, some people feared for the safety of the Netherlands’ team should they have won the World Cup in Buenos Aires. The Argentinians had already tried some cheap gamesmanship earlier in the evening when they complained about the plaster cast on the arm of Rene van der Kerkhof. Mostly, however, right wing supremacy was subdued after WW2 and European politics settled into a middle ground of coalition and consensus. Extremism has invariably been crushed in its infancy and football’s nationalistic streak has been diluted decade-by-decade as the concept of “club as mini-nation” started to take root. 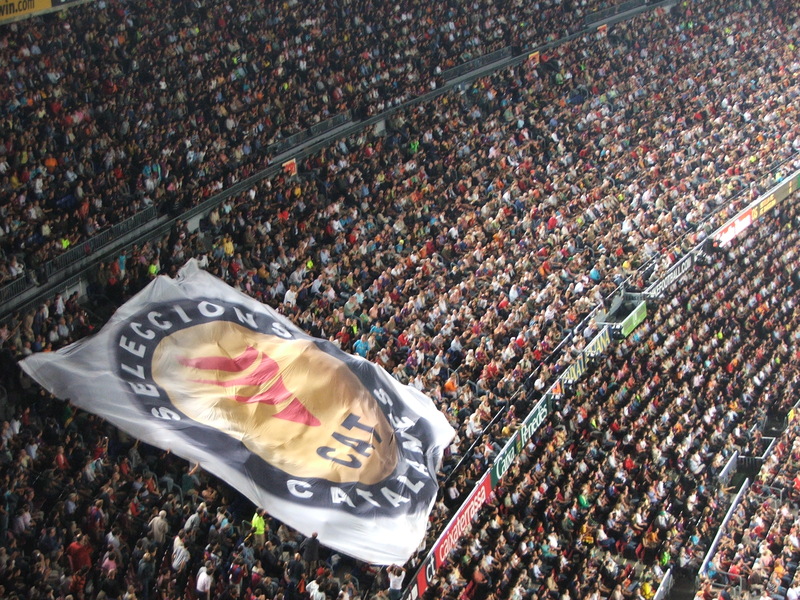 Dare we say that a Barcelona fan cares more about the Nou Camp than he or she does about the football nation? Not even the old uniformed eastern bloc was able to sustainably harness the undoubted energy of its young players as an expression of vitality, clean-living and devotion to the cause of mother socialism. Iron Curtain countries like Hungary, Czechoslavakia, Yugoslavia, Bulgaria and Poland had fleeting glimpses of success, but they were too inconsistent to become true leaders of the game. And of course there was the Soviet Union itself, which could draw on a vast resource of players from the Ukraine, Georgia, Russia and the other states, but very often flattered to deceive. Everyone respected their fitness, discipline and technique, but secretly – in Cold War Europe – nobody wanted the East to flourish. Would an increasingly liberal Europe have permitted the “evil communists” to become the standard bearers of the game? If Hungary had won in 1954, as most people expected, would that have radically changed the shape of European sport? Today, football – perhaps more than ever – is a reflection of our society. The free-market has taken over the sport and the imbalance of wealth has destroyed the strength of some historically powerful football nations. It’s also a reflection of the corporate world, where traditional local “champions” are being consumed by huge conglomerates. The football labour market has become so accessible that, naturally, players gravitate towards money. They may kiss the shirt and tweet about how wonderful the fans have treated them, but they arrive, set their agent to work and then move on, very often before their contract is up and after a period of self-induced and strategic agitation. Clubs are merely collections of hired hands from all over the world. This has made an elite group of clubs and individuals obscenely rich and has reduced the attraction of lesser leagues and clubs. And for World Cup, now read Champions League. Are politics and football indelibly linked today? In a way they are, but the politics are different. The currency is, quite literally, currency. No longer can football clubs easily represent an ideology, instead they are icons of an all-consuming corporate identity and occasionally, like Barcelona, an extension of culture – Més que un club – that also acts as a source of regional identity. There are fragments of extremism to be found in eastern Europe and some clubs have reputations for being right wing or anti-semitic, but most do not have critical mass. And we should be thankful for that, at least.